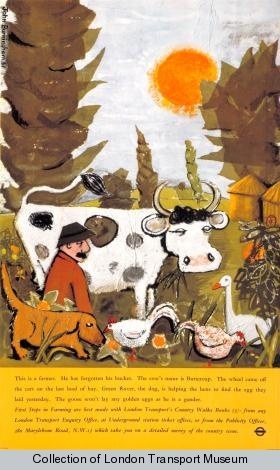 We’ve picked a fun poster this week by illustrator John Burningham. He was the creative genius behind over 60 illustrated books, but he actually started his career with poster commissions from London Transport. This poster was made to promote a book of walks which could be bought from Underground stations, Enquiry Offices and the Publicity Officer. If this was a book, what would you like to see happening in the next picture? Write us a few lines about what might happened next to the farmer, Buttercup, Green Rover, the hens and the gander! You can see this poster and 19 others by Burningham upstairs at the museum. If you’ve got children around over half term next week, bring them along to the Museum for story telling and puppet making inspired by Burningham’s posters and illustrations. 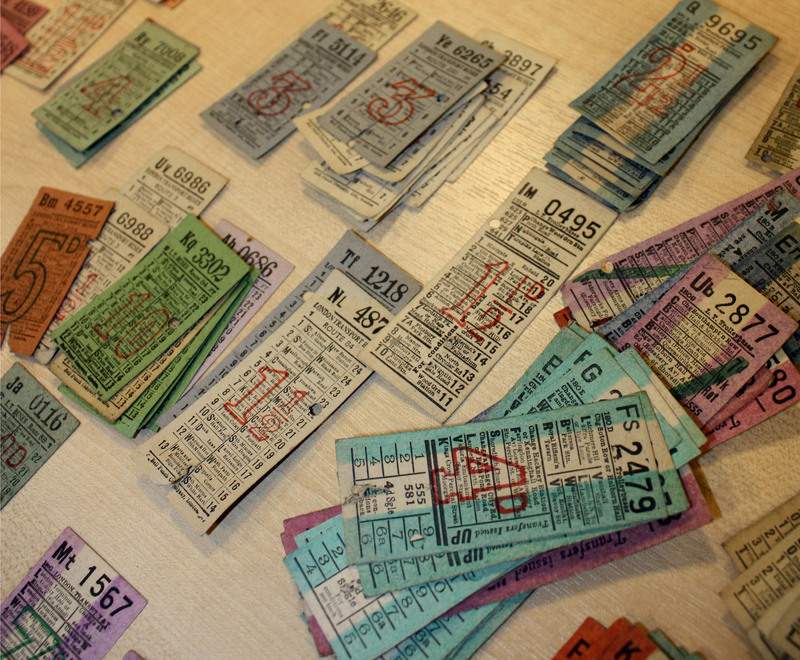 Do you have a stash of old tickets at home? Would you like to contribute to an amazing new artwork that will become part of a major exhibition? 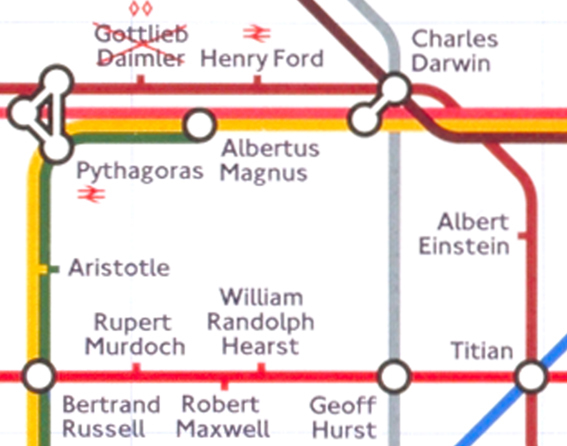 London Transport Museum is working on an exciting new project with artist Susan Stockwell, who has been commissioned to create a map for next year’s exhibition, Mind the Map: inspiring art, design and cartography. 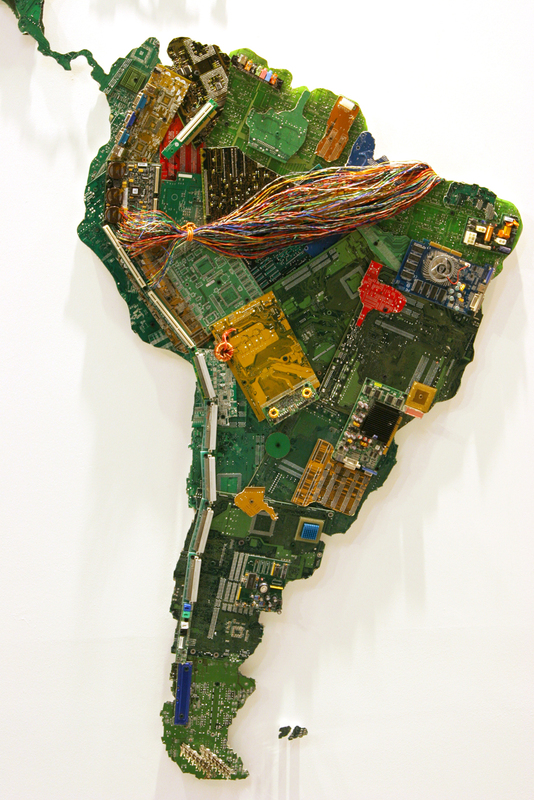 Susan’s artworks often feature recycled materials, from computer parts through to used money, which are transformed into beautiful works of art. On this occasion Susan’s work will be made entirely of used transport tickets. The artwork will explore the role of tickets not only as a ‘travel enabler’, but as a memory or symbolic representation of a journey. Tickets serve as a souvenir of people’s personal journeys; a memento from a particular point in time, filled with emotions and memories. Have some transport tickets you’ve been saving? 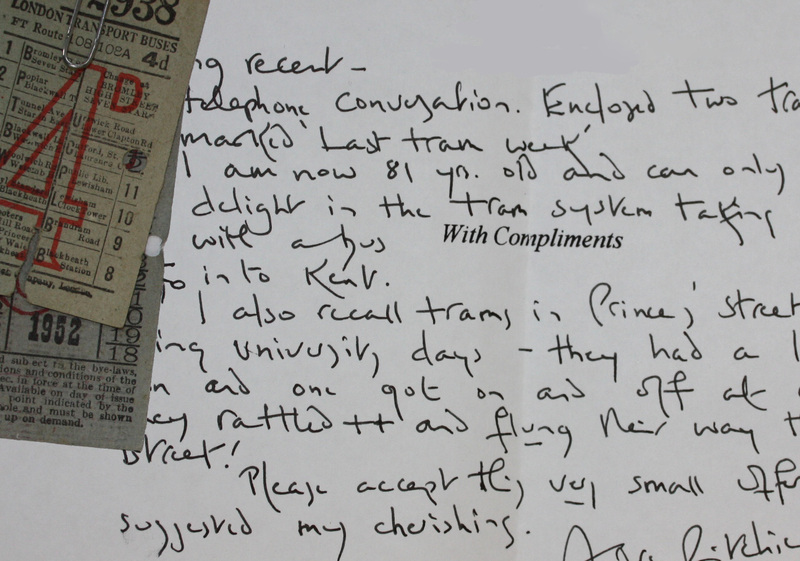 We’re busy collecting as many used transport tickets and associated memories as we can, which may be used in Susan’s artwork. 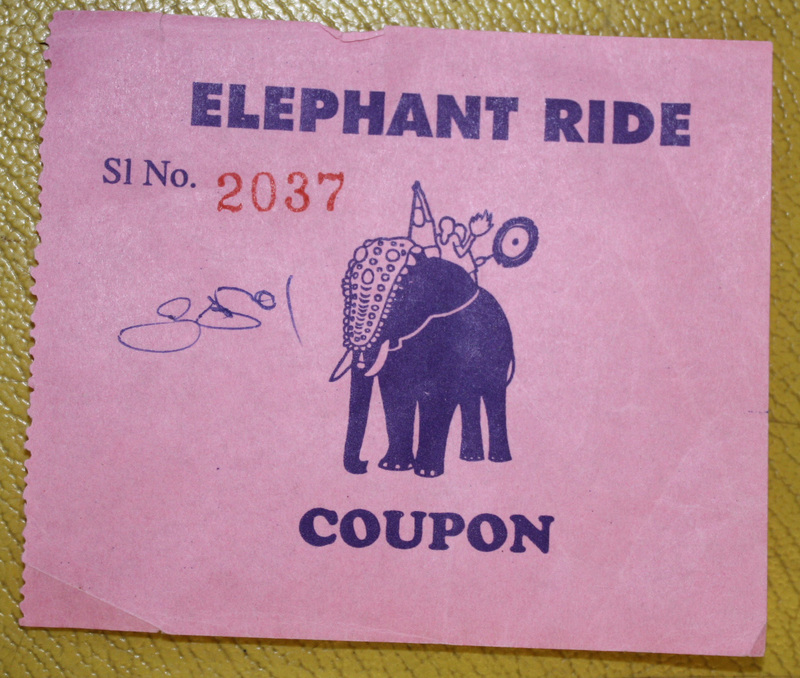 They can be any transport mode and from any country – winning prize for most unusual ticket so far goes to our Young Consultant, Elvis, and his elephant ride ticket from India. We’d also love to hear any stories or memories you might have related to your donation. If you don’t have any tickets, but would still like to contribute, comment or email us your favourite transport journey – from the regular and mundane to the weird and wonderful, we’d love to hear from you! We’ve had 2 more sessions with Acton Community Forum, helping Omar and the group learn more about accessing the digital world. You can see photos from the session on Flickr here. “The first task ahead of our intrepid digital experimenters was to use the London Transport Museum website to access the Museum’s archive, and learn the general layout and functions of a webpage. To this end they tried blogging for the first time, commenting on a blog written by Catherine about the previous week’s visit to the Museum Depot. They checked out the present and forthcoming events at the Museum using the ‘What’s on’ tab of the website. Arguably the highlight of the session was accessing the archive of the museum from the comfort of their chairs! The full poster archive is listed online. The team were tasked with looking through some of the thousands of posters on record and finding their favourite. Last week Omar taught his Digital Champions about using digital cameras. So this week we went back to the Depot to practise their new skills as budding digital photographers. Community Curator Catherine showed them the ropes while I made the tea in the new kitchen in the Lecture Room at the Museum Depot. The group got to walk around the stores again, this time with camera in hand to snap away at the various objects. 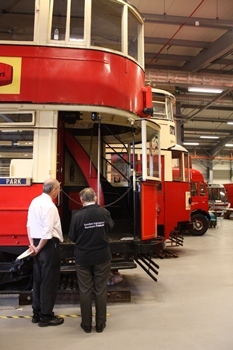 On the 8-9th October London Transport Museum opened its doors to the public at its Museum Depot in Acton. Each year the Museum opens its collection up to the public for two weekends in March and October. Each weekend is themed, and this time the focus was on highlighting our Engineering collection. As part of the theme talks, tours, film screenings, rides on the miniature railway, as well as demonstrations by TfL’s Emergency Response Unit, were all offered to the public. Throughout the weekend we had over 30 volunteers on hand to support the event. Some were able to put their specialist knowledge to good use by giving talks to visitors on specific engineering objects such as the Manor House sub-station control panel from Wood Green control room. The miniature railway team is made up completely of volunteers, who manage and maintain and the railway throughout the year in preparation for large events such as this. Over the two days over 800 rides were offered to visitors, which definately kept the team on their feet! Volunteers were also on hand to educate visitors in learning about some of London Transport Museum’s handling collection. 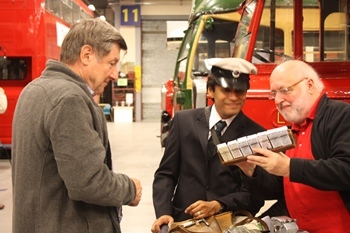 The theme Tickets Please!’ is a regular feature at Open Weekends and provides visitors with the chance to engage with knowledegable volunteers, as well as handle some of the museums ticketing items and learn about life on the buses. Across the two days volunteers engaged with a whopping 500 visitors, which just proves how popular the theme is and how valuable working knowledge from our volunteers can be in educating visitors. 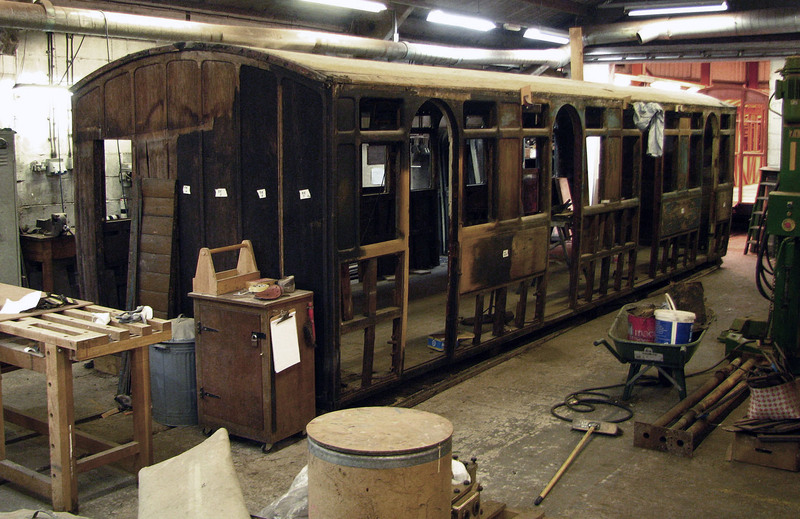 Preparations have been underway developing the project management plan for the carriage restoration. This important strand of work will dictate how the rebuild of Met 353 will be implemented; it has involved further research into the design of the carriage, identifying resources, assessing risks, refining costs and bringing togther the team who will be working on the project. As reported previously the contract has been awarded to the Ffestiniog Railway carriage engineering works, located at Boston Lodge near Porthmadog in North Wales. The company has an excellent reputation for restoring carriages to a very high standard, incorporating professional workmanship with attention to detail. Funding from the HLF has also enabled the Ffestiniog Railway carriage engineering works to recruit an apprentice, who will play a key role in the restoration whilst working towards a two-year NVQ Level 2 in Carpentry. A suitable 4-wheeled underframe (ex BR Southern Region, PMV 1746) has been kindly donated by the Quainton Railway Society for use in the restoration of Met353. In common with other heritage railway carriage restoration projects, the steel structure will be modified and shortened to accommodate the wooden body. Unfortunately, the original underframe built by Cravens for Met 353 has been missing for over 60 years – presumably scrapped a long time ago! Over the next few weeks the windows, panelling, doors and interior mouldings will be removed to reveal the main structure before it is repaired and restored to shape. Historically significant items, such as grab handles added to the carriage during Weston Clevedon & Portishead Light Railway (WC&PR) ownership, will be removed and saved. The engineering changes proposed to the underframe will need to be carefully designed, implemented and tested. To ensure these challenges are met, an independent engineer will be recruited with considerable experience of both heritage railway and Network Rail rolling stock operation and of vehicle acceptance. Working alongside will be an engineering representative from London Underground, who will monitor the work and make sure the carriage conforms for operation on Underground lines. Whilst it is early days within the life cycle of the project, I am confident the team working on the carriage will have it completed in time for special operation during the 150th anniversary in 2013. 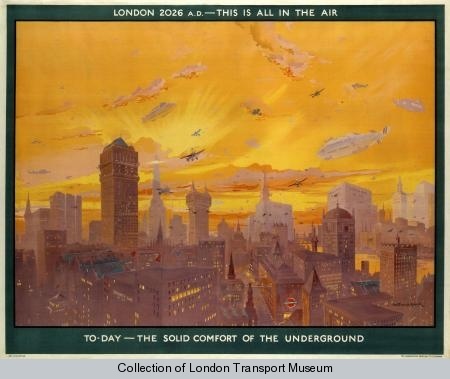 This week’s poster is an artistic vision from 1926 of what London would look like 100 years later in 2026. The skies are full of futuristic skyscrapers and flying things. The enormous airship on the right is branded ‘OVERLAND LINE, LONDON – SYDNEY’. There is a London Bridge Air Depot and an AIRTAXI Ltd building. Beneath the Bovril advert is a sign for ‘Underground to Scotland. Glasgow 2hrs 45mins’. The Underground roundel is a strong feature on the side of the building. Now that we’re just 15 years away from 2026, what do you think of Black’s vision? What do you reckon transport in London might be like in 2111? Montague Black was exploring the way the new technologies of 1926 might change the face of transport in the city. 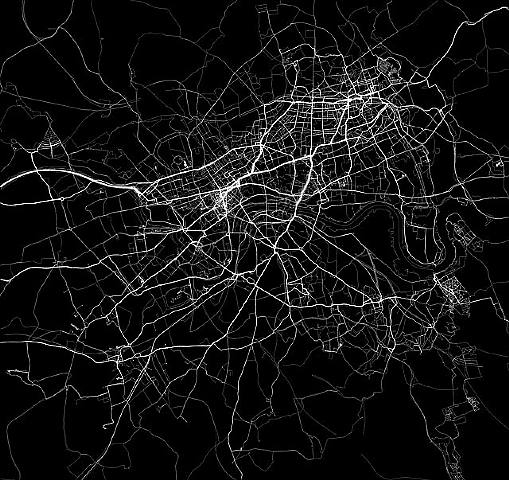 This Monday we’re hosting The City as a Canvas, a panel discussion which explores how new technologies are transforming the city today. The panel includes Usman Haque who recently organised Flight Path Toronto, a mass-participation spectacle where hundreds of members of the public took to the skies to rediscover the possibilities and wonder of urban flight. Find out more about the discussion event and how to get your tickets here.